Hot Strike Tennis Redemption Machine (2 Players) is a playing tennis game which combine sport with entertainment. Features with mini game including single mode and 2-player mode for players option, player can enjoy the fun game time of play against NOC, this mode suitable for new players, also can experience the fun of play against family or friend, this mode suitable for skilled players. 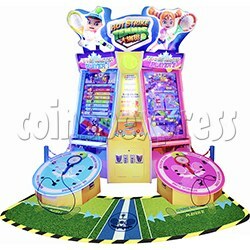 Hot Strike Tennis Machine's design is luxurious and gorgeous, equip with two HD LCD screens for players interact with the simulate tennis sport event. Game play is simple and easy, players enjoy more relaxed more interesting game time. Players insert coins, select the game mode, and confirm to start. During the game, players wave tennis racket, the character in the game will follow player wave tennis racket, player try to hit the tennis ball to win more scores. For the single mode, player only need to wave tennis racket to play the game, for the 2-player mode, player need to wave tennis racket and move left and right to play the game, the technical difficulties are greater. When the game over, the system is ranked by scores, and according to the scores exit the corresponding tickets.